Choosing a kitchen countertop is not easy. There are so many choices available, and other homeowners are no help at all. Some will tell you to choose this, and others will tell you to choose that material until you just don’t know where you’re at. You can always check what’s trending, and in most cases, you will encounter many people preferring granite countertops or quartz countertops. However, one trend might strike you as intriguing: concrete countertops. Concrete countertops are not what you might think they are. It doesn’t look anything like gray concrete pavement you may be familiar with. In appearance, it often looks like solid rock, and even mimics the look of granite, depending on the type of stain, pigment, or texture. It can also look unique as you can ask the installer to embed anything in the concrete such as seashells, tiles, glass, and even wood. You can customize it as much as you want to make it distinctive. There are some great things about concrete countertops aside from the aesthetics. It is quite tough, as you can expect, although not as durable as granite countertops. It is also heat resistant like granite, and it can stand a lot of abuse. Of course, it isn’t a solid rock, or even natural. In composition, it is the same as the concrete in your driveway, which is a mix of cement and sand, but an expert installer can make it look fantastic. This is the reason why it is the next hot thing in countertop materials. However, there are four reasons to avoid concrete kitchen countertops altogether. You might think that concrete countertops would be cheap, considering the base materials used for it is inexpensive. However, concrete countertops can actually be a lot more expensive than granite countertops. Granite countertops, installed, can go as low a $40 per square foot. In comparison, concrete countertops start at $65 per square foot, and designs that are more complex can be much more expensive. The main reason for the high cost of concrete countertops is it is labor intensive. It takes concrete roughly a month to cure properly. So, whether it is pre-case or poured onsite, there is that waiting time to consider. It also takes an expert installer to mix the concrete correctly as well as employ the right embedding, texturing and colorizing techniques to achieve the desired results. You may not have noticed how badly concrete can stain when it is in your sidewalk or driveway, a although you may have railed against all the weeds that seem to sprout on it as if by magic. However, you will definitely notice it when it is in your kitchen. Concrete is actually much more porous than granite or marble countertops, which is the main gripe for many homeowners. Concrete is just as vulnerable to common sources of kitchen stains as natural stones are. It will absorb any kind of liquid, from water to wine, and it is almost impossible to get it out once it sets. Even worse, concrete shows up stains quite easily, making your counters seem dirty and nasty. Worst of all, it can harbor bacteria, which is not a good thing for a kitchen work-space. If you want to avoid stains and food poisoning, quartz countertops might be your best option. Because it is highly porous, concrete countertops require regular sealing, just like marble and some granite countertops. Experts recommend resealing once a year or so, depending on how hard you ride it. You also have to avoid anything abrasive when cleaning concrete countertops because it might strip the sealer away. Aside from sealing, you also need to apply a protective coat of wax about once a month to keep the concrete looking nice and smooth. You can skip the wax if you don’t have the time and patience for it, but you won’t get the sleek, pristine appearance you might want for kitchen counters. Waxing is not something you have to deal with when you have quartz or natural stone countertops. Concrete is prone to hairline cracks, whether in the driveway or as a kitchen countertop. This has something to do with the concrete mix settling while it cures. Hairline cracks are especially common with concrete counters poured onsite, which is common when you have a bespoke counter. It can still happen with pre-cast counters, but it is not at common. To minimize hairline cracks, installers use a variety of support strategies, such as putting in wire mesh, fiber support, or rebar. This can help the concrete keep its integrity. However, cracks are still a danger, especially along vulnerable areas such as around cutouts. They are quite easy to repair, fortunately, but you will not have to deal with those as much when you have granite or quartz countertops installed by expert fabricators and installers. Despite the hoopla around concrete countertops, it is something you should avoid when choosing countertop materials. Most homeowners are not aware of these four common problems with them. They would definitely think twice about it if they did. There is no sense in risking their time and money on something that does not really look all that much different from natural stone and quartz countertops. Of course, natural stone and quartz countertops have their own issues, but much of it goes away when you have a reliable contractor supply, fabricate, and install it for you. You can do no better than Granite ASAP. 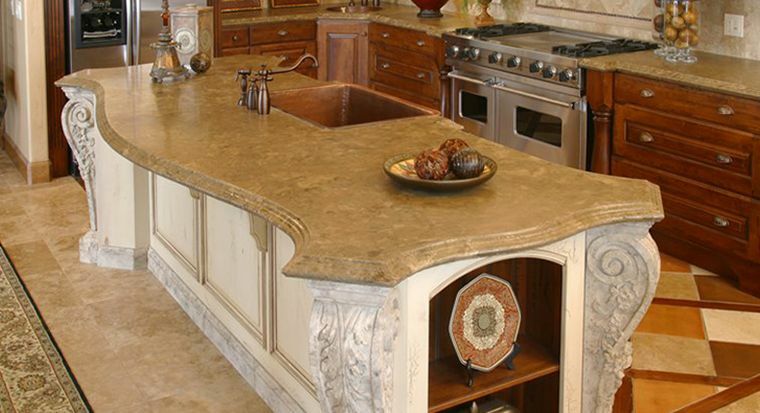 We carry a wide range of natural stone slabs as well as the best-engineered stone brands in the country. Over 100 colors of granite and marble slabs are available for inspection at our Chantilly, Virginia showroom. If you prefer engineered stone, we can offer you products from the Cambria, Caesarstone, Silestone, and MSI brands, each one carrying the manufacturer’s warranty. You can choose what you want and we will deliver it ASAP!